Classics adonis, Bamboo and Tuxedo call for sherry but these drinks are hardly shaking up the cocktail world right now (none appear in our 50 Classics list). No matter, sherry’s appeal is now as an ingredient of new creations, often at the expense of vermouth or other fortifieds, or wine. In the case of Pedro Ximenez, for a rich source of sweetness. So which brands are making an impact? 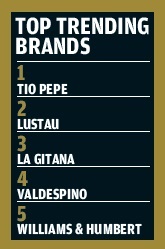 Tío Pepe is the largest selling sherry brand globally and also the overwhelming favourite among our polled bartenders. The Gonzalez Byass-owned brand, which is known for value for money, has been pushing food pairing and cocktail competitions to change perceptions. Topping our trending list too, its future looks rosy. Lustau, meanwhile, has a long-garnered reputation for quality and, with its large portfolio that spans sherry’s styles, is a one-stop-shop for bartenders. 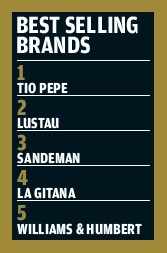 The Sandeman brand, under its new packaging, is readied to make further strides in the on-trade.